Four deserts. Four races. A thousand kilometers. On foot. Can you even imagine? I could not. At least, not until last week, when I had the opportunity to watch the documentary “Desert Runners.” The documentary follows four racers as they tackle what’s known as the Grand Slam of RacingThePlanet’s 4 Desert Series, which is completing four self-supported 250-kilometer races across four of the world’s most extreme deserts – the Atacama in Chile, the Sahara, the Gobi and Antarctica – in a single year. It sounds absolutely bananas on paper, and it becomes even more so when you watch the punishing races actually unfold before your eyes in beautiful full color. But you don’t have to be into running or endurance sports or adventuring to enjoy the documentary, because at its core it’s not so much about ultrarunning as it is about seeing what happens when ordinary people take on extraordinary challenges. I think this is something we can all relate to in some way, whether that’s because we have tried to do something extraordinary or because we want to do something extraordinary with our lives. After I watched the documentary, I got to interview director Jennifer Steinman by phone, which I was really excited about. I gushed for a while about her movie, and then we got down to business. I’m posting a somewhat abridged transcript because the full interview – which lasted about 25 minutes – is quite long, and she was so engaging and interesting that I’d hate for anyone to tl;dr this. Plus, if you read to the bottom you’ll get a special discount code for a download of the documentary, which I highly, highly recommend you take advantage of. Caitlin: What inspired you to make the documentary in the first place? Jennifer: I first met Dave O’Brien, who is one of my characters, at a conference. It was a conference about health and nutrition and he was giving a talk about an ultramarathon he had run twelve years earlier in his forties. He had done one race, the Marathon des Sables. So he was talking about this race he had done in his forties, and I had never heard of an ultramarathon before. I think I had heard of a 50-miler before, but I had never heard of these races, where people do things like this. Dave O’ Brien, the initial inspiration for the documentary. And for me, I had just come from the hospital – my mom had been really sick and she was in the hospital – and I remember thinking my mom is not that much older than Dave, and yet my mom doesn’t even think she can run around the block. What makes this guy think he can run a thousand kilometers through the desert? And what’s that all about? And it was the idea about, why do some people think something is possible that other people say is impossible, and what’s that all about? Like, how do we decide what is or is not possible, and whether we set up these arbitrary limitations that we put upon ourselves. 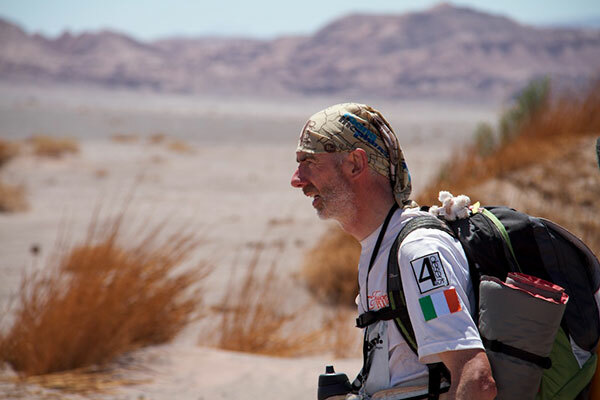 So I went up to Dave after the talk, and I said, ‘Have you thought at all about how you’re going to do what you’re going to do next year?’ and the next thing I knew, a couple of months later, I was in Ireland, filming him train, and then the next thing I know, I’m in the Atacama desert. Caitlin: So it happened really quickly. Before you knew it, you were up to your ankles in sand. Caitlin: So, did you come to any conclusions about what makes people like Dave and all the other runners that you profiled, what makes them tick? Jennifer: I did. I learned a lot out there from them, and I guess…the thing that I always say is every one of them had a different reason for being there, but the thing that they all had in common was that the reason was incredibly strong and usually very internal, a very deep internal need to finish a race like that. And the thing I really learned out there was that the difference between the people who make it and the people who don’t make it has absolutely nothing to do with fitness. I mean, I saw some of the fittest people I’ve ever seen in my life not finish, and I saw people you literally think couldn’t run 5K finish 250K. And it was purely…the thing that I always say is the difference between the people who made it and the people who didn’t make it, the defining thing is that the people who made it always believed they would and they never wavered in that. They never entertained, like they didn’t even let themselves consider the question of “what if I don’t finish?” That wasn’t even something they were willing to talk about. And then it was always that the only question they would ask themselves was “What do I need to do next?” And that was what got them to the finish line. Caitlin: Speaking of each of the runners, I read somewhere that you had your camera operators just go and start filming and then you picked them out as you went through the process. What was it that drew you to the four racers you decided to focus on? We sort of honed in on the Grand Slammers, because that was really our story, about the Grand Slam. There were 13 people doing the Grand Slam, and out of those 13, our four characters emerged as the people with the most compelling stories and the most compelling reasons why. Needing a really strong why, I felt like, they all had very different reasons for being there. Caitlin: Yes, they all had a story of some sort…You did really great job of finding characters. I really connected emotionally with all of them. I’m curious about Samantha, because I know there were a few female racers – I think I saw three Grand Slammers that were female, right? Caitlin: Was there anything about the other female racers that you found interesting or compelling? Besides the fact that, you know, they were out doing this event? Jennifer: Do you mean anything in particular? Caitlin: Oh, I mean any sort of observations you had about the women that were doing this kind of an event. You know, it’s one of those things where that kind of adventure and rugged living and being dirty and away from civilization is not something that a lot of women really go for, and I’m always very interested in the women who do actually go for it because it’s so outside of our realm of what is kind of expected of you. So I guess I was just curious if you had made any sort of observations the other women that you didn’t focus on while you were out there. Jennifer: One thing that I noticed was that the women are very, very determined, and it’s sort of like a tortoise and the hare situation, like a lot of the guys go out really, really hard and then crash and burn, and all three women who were doing the Grand Slam, I mean, slow and steady wins the race, and all three of them were so strong and so consistent. And [one of the runners] had a knee injury for three out of four races, and she basically limped her way through, but she was never going to stop. It didn’t matter how slow she went, and it didn’t matter how much she hurt, but she always finished, and it was so impressive. She had this very consistent pace, and she just, it was always the same pace, you could always see her out there running with the exact same stride and the exact same pace. It wasn’t very fast but she completed the distance and she was so determined. It was very, very impressive. Caitlin: Yeah, I remember seeing lots of footage of Samantha running, and I had the same sort of opinion about her, where she was just consistently clipping along at a pretty good pace, every time we saw her, whereas a lot of other people were walking quite a bit, which, you know, I would have done the exact same thing, I would have been walking all the time too. My husband and I both loved the relationship that developed between Samantha and Lisa [Tamati]. We just thought it was very moving, to see the way that Lisa took Samantha under her wing at the very beginning and then to see how they sort of became support systems for each other. I’d like to hear a little bit more about the relationship that developed between the two of them. Lisa Tamati and Samantha Dash in the Gobi Desert. Jennifer: I’d have to say it was probably one of my most favorite moments of the entire year on that day in the Gobi where we came around the corner and saw them running down the road holding hands, and I nearly burst into tears. It’s one of my favorite scenes in the movie. I feel like the camaraderie and the partnership that was formed out there and the support that they gave each other, and they literally dragged each other across the finish line, and both of them say they wouldn’t have made it without the other one. You know, they passed everybody else, that was the power of that level of camaraderie, and I just thought it was, like, one of the most beautiful things I’d ever seen. Caitlin: And Lisa’s basically a legend in ultrarunning, so I imagine she didn’t become as successful as she did without that kind of killer competitive edge. That’s a great story, that’s so funny. So three of the four racers you followed had some really scary things happen to them. How did that affect you and the crew while you were out there? Jennifer: It was really hard. You know, we were all really close out there. We really bonded and we were all having the experience together, and they were happening to our friends, and it was always hard. But the good thing is you’re never alone out there, and as much as we were just trying to be objective observers as much as possible, there were times when you couldn’t help but be involved. I mean, when Ricky came up to the car and said, you know, “I don’t know if I’m gonna make it,” we hopped out of the car and we stayed with him. We were also, like, walking with him for four hours. He otherwise would have been alone by himself, walking through the desert in the middle of the night. So things like that were instances where we did play a role in what happened. We couldn’t help it. It was just part of the experience that we were in. I always try to keep my filmmaker brain and my friend brain as separate as possible, and do the best thing I can for the film, but at the end of the day if I ever have to make a choice between what benefits the film and what benefits the people, I always choose the people first. That’s my personal rule of thumb. Caitlin: I imagine it would be hard to spend that much time with people and see them suffering so much, especially with Nick Kruse [an ultrarunner who died], you feel that responsibility probably even more, I imagine. Caitlin: What happened with Samantha [who was the target of an attempted assault], that particularly resonated with me as a female runner who often runs by herself, and also I was really blown away with how she handled it, how she got back out and she was like, “Well, I’m going to finish my race.” Can you talk a little bit about your observations about that? Jennifer: That incident for me was something that we never in a million years could have seen coming, and it was really important for me to include it for a couple of reasons. Number one, because I did feel like women and people everywhere should know yes this can happen anywhere, even in the middle of the Sahara desert, and also for exactly what you just said, which is that I felt like I didn’t really want to talk about what happened very much. What I wanted to talk about was how she dealt with it and what that said about who she was and the content of her character. I felt like the way she handled it was so heroic and for me that’s what that experience was all about. Caitlin: Yeah, she was so resilient. It was one of those where you just wonder how you would react in that kind of situation, and I was just so, so impressed with her emotional strength in that situation. Goodness, that was a really difficult part for me to watch. Jennifer: Yeah, and difficult for her to live. Caitlin: Oh yeah, I can’t even imagine. And for her to be as disoriented and as tired as I imagine she must have been…yeah, it was one of those worst nightmare scenarios, you know? So one thing I kept thinking when I was watching the documentary was not only how much of a challenge it was for the racers, but how much of a challenge it must have been for you and your crew. Like, I would see the cameraman would be running alongside the racers, and it’s hard enough to keep your camera steady but when you’re running, and there’s that crazy wind and all that sand, it just makes it that much harder. Did you and your crew do any sort of physical training to prepare for this ahead of time, or did you just go and kind of wing it? Jennifer: We just kind of winged it. I’d say we winged it on the first race, and you know, there’s nothing quite like hanging out with ultrarunners to inspire you to get into shape. I definitely think we both spent some time in the gym in between races so that we could keep up. But yeah, we had four-wheel drive vehicles that couldn’t get to the race course a lot, so we spent a lot of time running, climbing, scaling sand dunes, hiking. We were up at five o’clock in the morning and going to bed at midnight and not showering for seven days at a time. It was definitely a rough and rugged experience, to say the least. But then again, we weren’t running it so we didn’t really feel like we had the right to complain, you know? Caitlin: Right, I’m sure it would have been hard to complain in front of the racers, but I’m pretty sure anyone else who wasn’t racing would completely understand. So what were some of the more logistical challenges you faced? I imagine there had to be a few. Jennifer: Oh, I mean there were tons. And it was just the two of us, and we’re trying to cover all these people that are spread out all over the race course and so we were constantly trying to calculate, you know, ‘If we go and follow Samantha over here, then we have to go back and follow Dave and then where’s Tremaine on the course and where’s Ricky,’ and you’re constantly trying to find people and figure out how you can follow one person and get back in time to see other people. And then all that is complicated by…we had drivers in every country who didn’t speak English most of the time and often didn’t know where they were going, and so we were trying to do that without getting lost in the desert. In the Sahara desert you couldn’t go backwards. Once you’re barreling down a massive sand dune, you couldn’t go back up if you wanted to. You were committing to it. So it was complicated, it was definitely complicated. And it was sort of a game to figure out which way we were going to go, and we just did our best. I’m sure a lot of cool stuff happened that we missed, but we figured we’d get enough of something. Caitlin: It didn’t even occur to me that once you go down a sand dune you can’t go back up. You sort of have to commit yourself to going in that direction. Caitlin: What were some of your favorite aspects about this whole experience? Jennifer: We were in some of the most beautiful places I’d ever been in my life, and I think all of us felt so lucky to see these places and experience them in this way. Most of the places we were, I’m sure this was the only time in my life I’m ever going to get to be there, and so we were constantly just taking in the landscape and the scenery. It was so stunning and so beautiful. And the friendships, the people we met out there. At every race there were people from 40 to 50 different countries, and it was such an amazing global cultural experience. We made friends from all over the world. It was definitely a bonding time, it was very special in that way. Caitlin: Very cool. Yeah, that was something I thought was so cool how you were in the Sahara, you were in Chile, you were in Antarctica. I mean, who even goes to Antarctica? But there you were, which I thought was a very cool experience. So how has your documentary been received by the public so far? I’ve seen that you’ve won some awards, which congratulations, they’re very well deserved. Jennifer: Thank you. Yeah, it’s been awesome. People have been really loving the movie, which for me is the best compliment I can get, and it’s been going all over the world, which is very fun, and it’s getting good reviews and great press, so that’s been very great, I’m very proud of it. Jennifer: Yeah, it’s in the very early stages of development, but it’s going to be about girls high school athletics and we’re starting with lacrosse. Caitlin: Oh, that’s like right up my alley! I’ll have to keep my eye out for that. Based on what I’ve seen with “Desert Runners,” I’m excited to see what you do with girls high school sports, because that was a really important thing to me when I was growing up. Jennifer: Yeah, it’s a pretty big part of a lot of people’s lives, and unfortunately I think it’s becoming more stressful than fun, which I wish they would figure out how to put the fun back in, you know? Jennifer: Thank you and thanks for writing about the movie. I really appreciate it. Caitlin: I was happy to do it! Click here for more info about the film and the runners, to check out the trailer, and to buy the film on DVD and digital download. Make sure to use the code FITNESS for a 10% reader discount on downloads. Skimmed through the interview now & will read more after work but wanted to give you a heads up the link at the end isn’t working! Yikes! Thanks, I just fixed it. Um, hello awesome interview! More like this please! Thank you! I like doing Q&As/interviews with people. I will try to do them more often. And also, how cool that your friend ran the Marathon des Sables! That’s one of those races I am fascinated by. Duly noted. Although honestly, wouldn’t chilli snacks upset your stomach, too? Thanks for writing about this. I’ll download this to watch. I’m so glad you liked it too! Isn’t it weird how something that looks like it could be so painful and so difficult can also seem so damn appealing? Loved this interview…curious to see the film. Now, are you up for this? I think two feminist Caitlin’s could make a fun team; my brother is a veteran rally racer and could train us. What say you? I just want you to know that hearing you say you loved this interview really made my week. Thank you! And YES that looks amazing! I’ve heard about these rallies before and they sound crazy (in a good way). I wonder how much it costs to participate. They want about $32K (25K euros) — so call it $16K each. We can do it!!! !